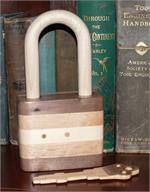 This is a modification of my completely wooden, Working Padlock, and is #7 in a series, all different. Utilizing my own design, most of the lock components can be disassembled and reassembled, enabling one to see the inner workings of the lock. 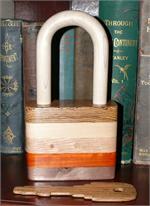 This is a completely wooden, Working Padlock, and is #8 in a series, all different. Overall height is 8". A quarter turn of the key moves the wood springs inside releasing the shackle. Made from Poplar, Bocote, White Pine, White Oak, Padauk, & Walnut. This is a completely wooden, Working Padlock, and is #9 in a series, all different. Overall height is 8". A quarter turn of the key moves the wood springs inside releasing the shackle. Made from Poplar, White Pine, White Oak, Padauk, Walnut, & Olivewood.